So, I saw and immediately knew I wanted to try it. But I took awhile to get around to it. However, the other day, my friend Angie asked me if I’d tried it yet. When I told her that I hadn’t, she told me that I must, must try it as soon as possible. I’ve never known Angie to steer me wrong, so I made it a priority. And I’m so very glad I did. Folks, these bars are the bomb. What’s even more amazing is that they are packed with nutritional goodness. There’s only one problem: it’s near impossible to eat just one. So if you’re trying to watch your calories, you might just skip over this post. 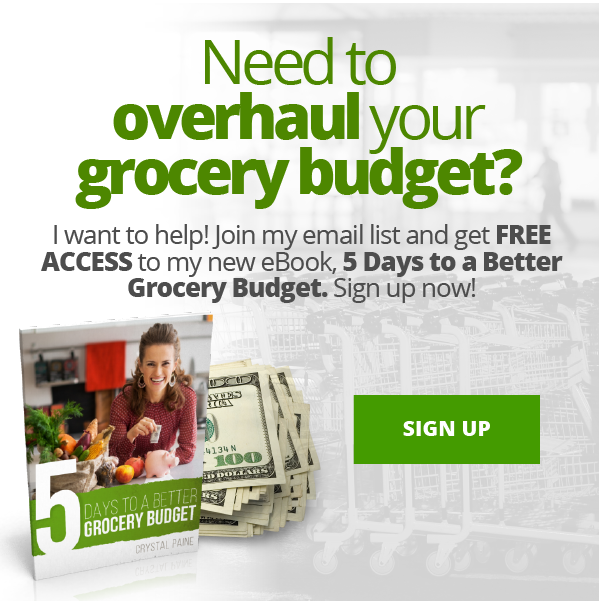 Money-saving tip: I’d recommend checking the prices on Vitacost & Amazon for the ingredients in this recipe to see if they are less expensive online than you can find locally. You can when you sign up . Or, you can earn free Amazon gift cards from Swagbucks to use toward purchases like this. I’m gluten intolerant and have never had issues with traditional oats but I know most celiacs avoid them and understandably so. The GF oats are so much more expensive! Try the ones from Trader Joes ! GF & Dairy free. I love them. Trader Joe’s has great almond butter at a fraction o the cost of most stores. I’m not sure what the price was, but I noticed the other day that Costco carries almond butter. It might be worth checking out. I make my own almond butter. It tastes amazing and so easy to make. Need a high powered blender though…. These look so good but I am always worried about things with Coconut in them. I am allergic and so I have to be careful. Does it take away from the awesomeness if I don’t use coconut? I think you could totally add in more oats or ground flax seed or wheat germ (or something like that) instead of the coconut. And then just use butter instead of the coconut oil. I’m going to try that because I don’t like coconut! Are you allergic to coconut or maybe just the sulfiting agents (usually sodium metsbisufite) that they use to preserve it)? If it is a sulfite issue you can buy sulfite free coconut at a health food store or the Bob’s Red Mill coconut sold on Amazon. I have read a lot of recipes that call for peanut butter and I just go to the next recipe that I can make, because my daughter is allergic to peanuts and the doc said to just avoid nuts in general. (We can have sunflower butter.) Is there a substitute for the peanut butter that is also nutritious, but doesn’t cause allergic reactions? I think that sun butter would work in this recipe, but it might give it a bit of a different texture and flavor. Barney Butter (you can find it online) is made from almonds in a peanut free facility, so it’s safe for people with peanut allergies. And it subs in great in recipes like this. And if you don’t mind soy, you can also use Wow Butter made from soy. My son is highly peanut allergic and I use both of these as substitutes for peanut butter when cooking or baking and they will both sub in directly with no change to a recipe. AGREED! I have used Barney butter and WOWbutter as a substitute and have had excellent results… I LOVE the Barney butter as it is the closest to commercial peanut butter that I have found, I have some friends that really miss that so I’ve tried to get as close to their memories as possible LOL! I eat it often just because it is so darn good, PLUS it comes in crunchy which is added flavor and texture. We use sunnut butter for my son who is highly allergic to peanuts and other nuts. 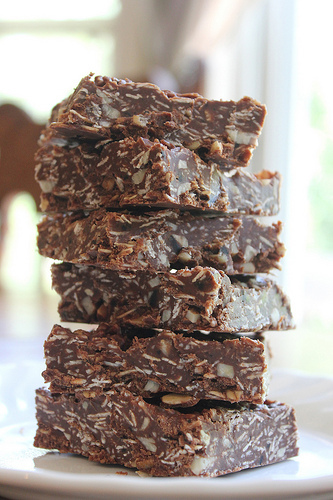 I use it make no bake granola bites and scotcheroos with it all the time. My daughters are also allergic to peanuts and tree nuts. I found a recipe for granola bars on a site that introduced me to Biscoff spread, or Trader Joes calls it cookie butter. It works great at a peanut butter sub in recipes, but I haven’t tried it in these yet. It has the same consistency as peanut butter, and it tastes like graham crackers…delicious! It is a bit more expensive, but I don’t know the difference between it and sunflower butter in price. It also works great on celery with raisins as a healthy snack! I found it at my local health food store. You need some sweetener in it. You can’t taste the honey, though. But maybe you could sub maple syrup or corn syrup? This sounds amazing! Trying it tomorrow. Thank you, Crystal. These are about 240 calories a piece. I used an on line calculator, that being said, I can’t wait to try them. They’ll be good when we head out hiking and to the beach. I was kind of hoping no one would calculate the calories because I didn’t really know that I wanted to know. 😉 Now I’m curious, though, how many did you divide the recipe by? Would also love to hear how many you divided the recipe by. Thanks. Oops – I thought of that after I hit enter. I assumed a 9X13 pan – divided into 24 bars. This recipe has a lot of fat in the peanut butter and coconut oil, so I will probably decrease the oil and the honey a bit too. Surprisingly, coconut oil was higher in calorie count than butter, but butter does have water in it. Commercially prepared peanut butter has a lot of sugar. I am doing a month of no refined sugar and these have saved me and my sweet tooth many times. I use unsweetened coconut and substitute 1/4 cup cocoa for the choc. chips. I mix the cocoa in right after you take the liquid mixture off the burner. They are so good that my kids end up eating way more of them than I do. I can’t have chocolate so maybe I will try with carob powder. Thanks for the idea! Thank you for this! I was thinking that these really aren’t ‘clean’ if they have regular chocolate chips in them. The cocoa powder helps with that a little 🙂 I was trying to figure out how much to add in and when! Awesome! I was also thinking that a cup and a quarter of chocolate chips is an awful lot of sugar! I’m going to make these right now with the cocoa powder. Could you try almond butter or sunflower butter? almond butter is getting to be very reasonably priced… if you shop at Costco it’s even more affordable. You can buy a large jar in Canada for less than $7 so it is likely to be cheaper elsewhere. In a pinch you could buy your own almonds and roast them and grind them in a food processor until you had homemade almond butter, the texture might be a little looser, but will taste just as fantastic and maybe even a little less sweet! Try soaking a mixture of dates and raisins in some very hot water for about 15 min. before you want to use them, then placing them in a blender or food processor and blending them until smooth, with a little of the soaking water as needed, until you meet the desired consistency. You could add nuts to this mixture and blend. Such as cashews, walnuts, sunflower seeds for extra protein/creaminess. 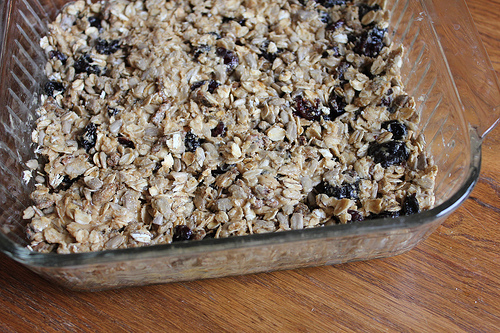 I’ve used this mixture many times to make similar bars that my kids adore. They call them “coo-coo” balls b/c they were too little to say cookie, which is what they thought these were! If you go this route, you can safely cut back or eliminate the honey as well b/c of the natural sugars in the fruit! Oh, yum. Definitely making these. I love seeing Pinterest wins! Omg I made this tonight for dinner, the kids loved it and ate everything … so delicious. thanks for the recipe. We must visit the same Pintrest pages. I have been tinkering with this recipe for a few weeks. My suggestion is to add a tablespoon of Chia seeds to make it last outside the frig a bit longer. This week’s high humidity have made the bars a pile of goo outside the frig for more than 15 minutes. Your mixture should have burned that easily because coconut oil has high flash point. Also, you only need a cup of the chocolate chips, any more it does not really effect/enhance the taste. A pinch of salt helps to bring out the flavor more. Thank you so much for these great suggestions! These sound yummy and look reasonably easy to make so I’ll be in the kitchen with my daughter this weekend giving them a try. So excited to try these! I think I will add in chia seeds. Thanks for posting! How are you defining clean eating? I ask because there seem to be several definitions, and the ones I am familiar with don’t include chocolate chips. And given that I’m not ever giving up chocolate, I can’t ever seem myself ‘eating clean’ as I have been understanding it, so I’ve kind of dismissed the whole idea. But something like this I could live with. 🙂 By this I mean, I feel I can make some changes for health, but I don’t think I can give up chocolate forever, although I do understand that this is occasional treat type stuff. So having said all that, I would love for you to talk about how you define clean eating or point me to it if you’ve already said it and I just missed it. Thanks! 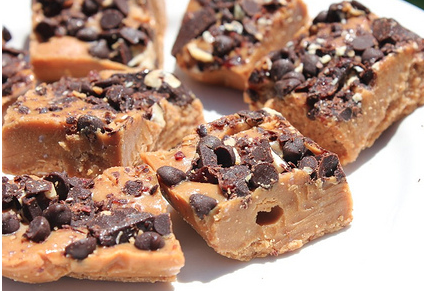 These are a variation on classic no-bake cookies. I’ve made those with butter or coconut oil,old fashioned oats, quick oats, cornflakes, coconut or none, half the sugar the recipe called for (came out a bit softer), nutella instead of peanut butter, and all variations were delicious. 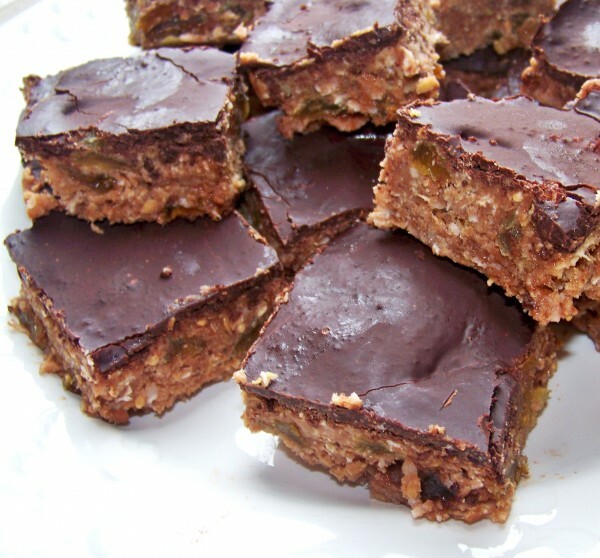 Some recipes use no nut butter, almost all use cocoa instead of chips. Basically, if this recipe doesn’t work for your needs, get thee to google and find similar. I love these! I also throw in chi seed, flax seed or flax meal with 1 cup of chocolate protein powder. might have to add a little more honey though or it might be crumbly! ok, so I tried them, and they were delicious…. but just a note, I used chocolate chips instead of the dark chocolate b/c I didn’t have any, and they were too sweet- so next time I would decrease the honey. Other than that, they were great! Thanks so much for mentioning that. I think the dark chocolate taste versus semi-sweet chocolate or milk chocolate could definitely make a difference. Do you think I could use stevia instead of honey? I’m trying to watch my sugar. Gluten Free and not made of pseudofood? And I don’t have to feat up the whole kitchen?Yes, please! I just made these, and they were so, so good. This looked so good! I hopped into my kitchen and had my daughter help me. It took me less than 15 min. for everything including clean up ! Can’t wait to devour these treats after dinner! First, can you tell me, what is coconut oil? Does it taste like coconut? Can I use regular oil? And second, is there something I can trade for the shredded coconut, or can I leave this out? My family hates coconut! Thanks so much!! You can use butter in place of coconut oil. Don’t use regular oil since it won’t harden up. And you can use extra oats or even something like wheat germ or flax seed in place of the shredded coconut. These looks a lot like the cranberry chocolate energy bites. Those, I leave out coconut because I think the flakes are gross (its about texture) and I spread them into a pan and cut into bars/pieces. So nice having something quick and chocolatey I can grab a small bit of during the day. Made these today and they were a big hit. 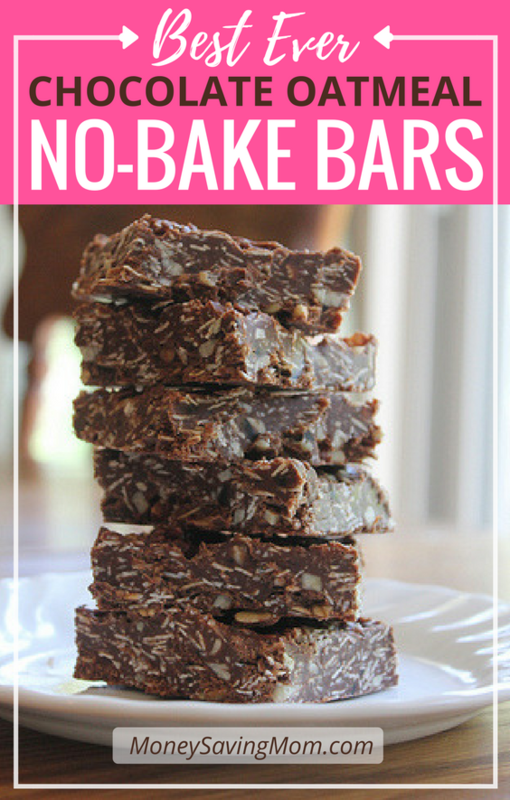 I liked them better than any other no bake cookie I’ve made (and we do like those.) I tried it with cranberries and will probably leave them out next time. Might try sunflower seeds or even crisy rice. Thanks for sharing! Thanks so much for sharing! I made these last night & they are wonderful! My husband complained that he couldn’t stop eating them. 🙂 I substituted organic brown rice syrup for the honey & used dairy free chocolate instead of chocolate chips. Hooray for a dairy free dessert! 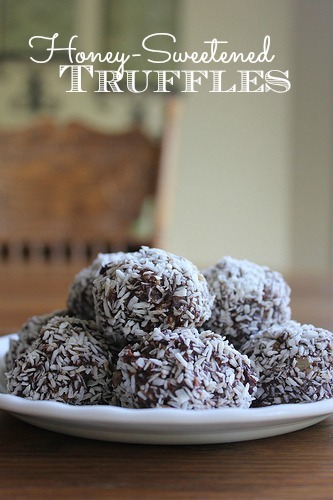 I just finished making this recipe (minus the coconut)…..Oh they are sooooo delicious!! I make something similar called protein balls… same ingredients minus the coconut oil (I try not to consume any oil so that works better for me anyways). I just mix all the ingredients, refrigerate for an hour and then form in little balls and store in the fridge. I do not use coconut either but add in flax seeds, protein powder and cocoa powder. These types of recipes lend themselves to substitutions pretty easily, I think. Made these on Friday night – they are wonderful. Hubby said it was one of his favorite, daughter said I could make them anytime! So happy you all enjoyed them! OK ladies! I need help! I made these this morning but I didn’t have any chocolate chips so I substituted cocoa powder. However, since my 3 young children have made my brain mush I put in the same amount that was called for the chips. So…they are not sweet AT ALL. I’ve already got them in the pan. Is there anything I can do to sweeten them up? I have corn syrup and sugar. Could I add some things and make them into balls of some sort? Or is it too late??? Do u know how many carbs are in this? Just made these! Absolutely delicious! Delighted to find a recipe for a healthy “treat” for my kiddos! These were very good and work well with substitutions. I used butter and pancake syrup instead of honey. I also added a cup of Rice Crispy cereal and WOW great texture. Just tasted my first bar– YUMMY. Sooooo perfect for te chocoholic in your life. Love that this recipe called for ingredients I already had on hand and especially that its all whole foods! Easy to make and absolutely delicious to eat! Mine came out too oily. Maybe the wrong kind of peanut butter or something? Hey there! This is Beth from I’m so glad you love our tasty bars! Thanks so much for sharing them with your readers and tagging our site on your post. It’s very much appriciated. Thank you so very much for the recipe inspiration! Yum! I used maple syrup and butter, but I’d like to try it with coconut oil next time. I added some of the shredded coconut to the batter and used some as a topping on half with crushed peanuts on the other half. I liked the peanut half better. Great recipe with lots of possibilities. Thanks! I just made these and stuck them in the fridge. I’m picking the boys up from school in a bit and we are meeting a friend at the park. How fun to bring these to share. I’m going to feel like one of those Pinterest Moms – all cool with the gorgeous treats! Thanks! Is there a reason you don’t just melt the chocolate chips in with the other ingredients at he start or would it affect the outcome? I added mine at the end with the rest of the ingredients and there was no melting lol so now it’s oat bars with chocolate chips. I’m sure it will still taste great, I’m just curious about any reasoning behind it. I haven’t had regrets about any of the recipes I’ve made from your site, thank you! You are my “go-to” for recipes. Hugs from MN. add – 1/2 cup peanut butter, 1 tsp vanilla, 3 cups quick oats, Stir quickly to mix. Drop onto wax paper in cookie mounds and let harden. If they do not harden perhaps you didn’t bring it to a rolling boil or if high altitude you may need to use less milk. This is done really quickly because they harden fast – really good! I have made those a lot! They are easily my favorite cookie! can i substituted with other type of oats? i’m not sure have old fashion oats in my country. can i used instant oats? well, it would change the texture of the finished product. instant oats are very small in size compared to old fashioned oats or regular oats. These sound so yummy! Has anyone tried them without the coconut yet, and what did you use as a substitute? (I hate coconut, but don’t think I’ll mind the coconut oil.) How were they? Thanks!! Ok, so I totally hacked these, but had to have them with ingredients on hand! Made them with Oat Bran instead of Oatmeal and then just dropped them onto parchment paper on cookie trays. They were SO good!!! These were amazing. Quick and easy to make, and they hold up so well even after a week in the fridge. I added protein powder and chia seeds to mine for an extra boost. Soo happy with this recipe. Thanks! This is soooo good! I eat two every day. Did i say how big I made them!! ? I made them once and last night I made them again…I quadrupled the recipe and made extra çhoco/peanut. I put some in the freezer to set and the next day, I put the rest in the freezer. If you have a few minutes, MAKE IT NOW!! Heavenly. I am seeing the “clean eating” label. What exactly does that mean? Janell….it should mean no flour, no added sugar, no processed foods. 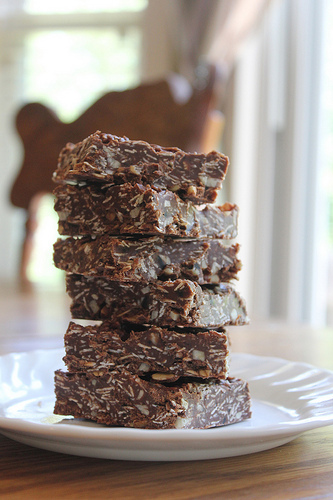 It is a stretch to call these clean…you would have to use unprocessed coconut flakes and cacao nibs and no sugar added p. butter. But, hey, at least there’s no flour! I rarely leave replies in recipe message boards but I had to post here… These are amazing! Make them now. I’ve just Found ur blog trough its amaizing? I looked it up, it’s 120 grams. Chocolate chips are little pieces of chocolate, but you will be melting it, so it shouldn’t matter what shape or form your chocolate is in. I hope this helps! Thank you for this quick & easy recipe!!! I did a microwave, single-bowl version…. Can you use cocoa powder instead of the chocolate chips? If so how much? Recipe looks really good and I can’t wait to make them. Once hardened I will decorate appropriately for a Halloween themed party!! Have we any idea how many calories a 2 inch square may contain?? They are really tasty ! So incredibly good, healthy decadence! My family’s new favorite, thanks. Can you tell us how many calories are in a set serving? Recipe looks really good. can you use cocoa powder instead of the chocolate chips? I used 16 tbsp for a cup per the conversion table. Smucker’s all Natural PB, unsweetened coconut and walnuts instead of raisins or cranberries. It ain’t purty but I figure most of us are going to indulge a bit here and there so, moderation is the key. I’ve broken it down into the figures (rounded up) for the entire recipe and you can divide it accordingly and, I’ve broken it into 16 servings also. Wow, what a packed bar! I used it and tweaked it to make it less “candy bar” for my hubby and myself. I used natural nut butter, raw, unprocessed honey (better for you) I used only 1/4 cup. I toasted unsweetened coconut( that saved me sugar and fat) and enhanced the nut flavor. I used unsweetened cocoa along with 1/4 cup of unsweetened wafers melted with monkfruit (0 sweetener) mixed in it. (Again, saved me sugar). I also sneaked in chia seed and flaxseed to bump up the nutritional value. That way I can say I am eating healthy!!! Well, we can say that- moderation. They came out great. Even my 23yr son ate them without snide remarks. Thank you for the great recipe. This is a keeper. Now what can I add to it??? I add pumpkin seeds, hemp seeds, rice krispies(in exchange of oats),chia seeds , craisins, nut and seed butter (instead of all peanut butter), whatever you want and all so good! Def. need to be kept in fridge and freezer . I triple the recipe and eat them right out of the freezer! OMG these are fantastic! You are right so addictive but I need to gain weight! Thank you!!!! Does anyone have a Keto version of this recipe?